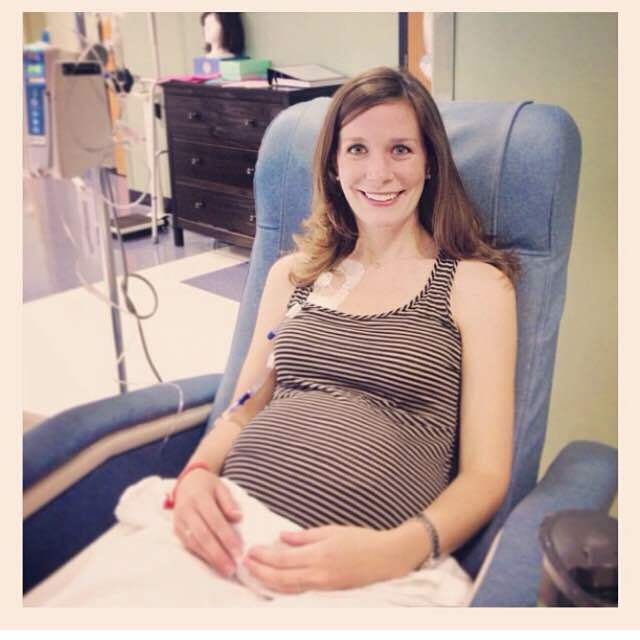 There she was -- a beautiful young woman with a third-trimester-sized belly sitting in what appeared to be an infusion room hash-tagging her Instagram photo #coloncancersucks. In disbelief I looked at the photo, and then looked again. At the risk of becoming a stalker, I went to her photography website and minutes later found myself emailing her through the contact form. Luckily my Internet snooping didn't scare her away and soon Lindsey Motley and I were on the phone swapping our war stories about facing colorectal cancer at young ages through such dramatic life events. I told her my prom experience and about being in high school while fighting colon cancer. She told me what it was like being diagnosed while 17 weeks pregnant, having a temporary ostomy with a growing baby belly and making chemotherapy decisions for two. Friendship ... is born at the moment when one man says to another, "What! You too? I thought that no one but myself . . .
Our initial phone call kick started our friendship and we stayed in touch over the years. I celebrated with her virtually as her daughter was born and loved watching the first year of milestones Lindsey so carefully documented. I was elated when she was selected to model for the Colondar, a publication by The Colon Club that shares the stories of patients diagnosed with colorectal cancer under age 50. She joined our family of past and present models, which only strengthened our bond. Between the Colondar, her Caring Bridge journal and her social media accounts, Lindsey put her story out there and let it change the world. Which is why I'm one of thousands, if not millions, mourning her loss today. There aren't enough words or pages in this world for the memorials that could be written to describe the impact Lindsey's life made on others. Simply put, she was a light. The luminary walk "Lindsey's Lights" her Greenville, S.C. community (and virtual community) recently did for her was a visual representation of the light she brought to all who knew her. She loved people and people loved her and she felt that love. But more than anything, Lindsey let people watch her go through this. And because of it, she's changed the world. Facing disease, struggles and pain can be a very private experience. And sometimes there is wisdom in staying private and laying low. But other times, there's tremendous power in going public. Lindsey showed the world that. She shared her story in many ways, through many outlets, and let those of us who followed her into her fight. She did it perfectly, too. While her posts focused on her life, it felt like she was really putting it out there for us, to benefit our lives. She let us pray for her. She let us see her beautiful family. She let us celebrate the good days. She let us see the bad ones. She made us crave donuts and fall in love with the Greenville front porch. She showed us what fighting colorectal cancer looks like. She inspired each of us still here to never give up. She certainly didn't. So many of us who loved watching her promise that her legacy will carry on. Although she's gone now, Lindsey's light will forever shine. She'll forever be sparking hope in others.